I’m beginning to wonder if nesting is a blessing or a curse. It is nice to get things accomplished around here, but when I’m working on limited time and energy it seems weird that I’m concerned with things like getting the tops of the door frames cleaned. The other day I was thinking about this time of pregnancy with Little. At first I thought, “I don’t remember nesting like this. I wonder why this time is different?” And then I really thought about it and realized that we closed on our house about eleven weeks before she was born and moved into it about six weeks before she was born. The time in between was spent packing, painting, cleaning the apartment, and getting the house ready for move in. Those final weeks were spent painting, unpacking, settling in, and getting Little’s things ready for her arrival. No wonder I don’t remember nesting! Anyway, I am trying to get things marked off my to-do list as I have the energy. And I’m trying not to worry about the things that won’t get done. These last weeks are better spent preparing for birth, preparing for Jack’s arrival, and spending those last “only child” times with my little bit of girl (btw – this phrase is the source of her nickname; I called her that a lot when she was a tiny girl). We’ll see how the “not worrying about things that won’t get done” part goes. And finally…It’s been awhile since I posted a Boo-belly picture. 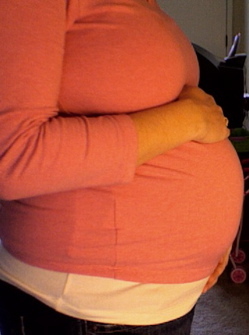 Here is one I took on Monday before my doctor appointment; we’re 32 weeks along. To those of you who stopped by and commented last week on Tackle it Tuesday: Welcome and thanks for visiting; I hope to see you again! I apologize for not making the rounds last week, life got in the way and I didn’t get to visit the other participants; I’ll try to do better this week. The biggest thing accomplished in our house this week was that Matt finished painting the trim in Boo’s room. Yay! Now we can begin the decorating/furniture placement phase of this operation. Before and after pictures will be posted at some point. This is what my stack looked like when I started. I’m not caught up yet, but I’ve reduced the stack size by approximately half. The remaining half will go on my tackle list for next week. From my housekeeping/nesting list I dusted the bookshelves and wiped down the baseboards and walls in the living room. Because I’m not a very thorough duster, the shelves were probably a bigger job than they should have been. It does feel good to have these two things accomplished, though. The plan for next week includes cleaning the fridge (I’ve been procrastinating a bit on this one), the living room wipe down/dusting (still lack upper moldings and tops of doors as well as the inside of the television cabinet), and completing the magazine job. Good luck with your tackling! It is a lovely 63 degree sunny day in our part of the world, and Little and I have been on the go. First came trips to the grocery stores (yes, we shop at two stores…at least…every week). We came home, unloaded our loot, made lunches, and headed back out; this time we were headed to the zoo with friends. The zoo was a lot of fun for all of us, but it wore Little out; she fell asleep on the way home. I’ve done a bit of cleaning while Little naps and now I’m worn out, so I’ll do some resting for a few minutes before I have to get back out for an appointment with the doc. I was going to leave you with a Boo-belly shot, but I’m having trouble uploading the picture. Hope you are all having a happy Monday! A copy of The Birth Book on the bedside table waiting to be read. A ring sling awaiting a baby to carry. Plans to buy one of these on my SIL’s recommendation. Registries created. Doctor’s appointments every two weeks, then once a week. A room in the final stages of painting. Blue clothes and burpies on the way. Little isn’t much for dialogue yet, but she does occasionally say something funny. One morning the first part of the week she and I were sitting on her bed talking about the letters on her wall that spell her name. Me: Those are the letters that spell your name. The letters are L-I-T-T-L-E (except using her real name). That spells Little and that is your name. She continued to play for a few minutes. And what could I do but laugh? This is my first time participating in the Tackle It Tuesday carnival hosted by 5 Minutes for Mom, but I decided that with my pre-baby to-do list growing as fast as my belly it might be a good time to jump in and get some things tackled. Saturday was quite a day around here for household tackles; I think Matt might be nesting, too. On Saturday he hung new blinds in the living room and Little’s room (something we’ve been intending to do since we moved into the house almost 2 years ago). He also got started on the trim painting that needs to be done in Boo’s room before we can hang his blinds and finish the nursery. We also put several new things on the walls in the living room and kitchen eating area and moved several other decor pieces around in the living room; as Matt said, it looks like we actually live here now. Yesterday I worked on the deep cleaning that I wanted to get done in the kitchen and eating area. I only lack cleaning the refrigerator shelves, etc to be finished in there. Then I will move on to the things I want to get done in the living room. I also got my kitchen junk drawer cleaned out and organized last week – for some reason it makes me feel really good to have accomplished that small task. So our tackles this week haven’t been real exciting or worthy of before and after pictures, but they are things marked off the to-do list. My goals for the week to come: clean the fridge, dust the books/bookshelves in the living room (actually taking the books off the shelves to clean for a change), and conquer the stack of back-issues of my magazines residing on the bedroom bookshelves. I’ve been feeling a bit deficient lately in the areas of coherent thought and comprehension. It could be related to the fact that I’m 31 weeks pregnant and chasing an 18 month old, but it could just be that my brain is taking a break. Therefore, I’ve decided to go the meme route today with this one I saw at Lauren’s the other day. I’m not sure exactly how it happens, but it seems that a new week begins and the next thing I know it is Wednesday already. Guess I will have to start setting posts to autopost on Monday and Tuesday in order to get any blogging done the first of the week! The big problem with this setup is that I feel like I have so much that I need and want to get done in the next few weeks and just don’t have the time and energy (especially the energy) to get much accomplished. Oh well, I suppose that as long as Boo has a safe place to sleep and a few clothes to wear the other things can wait. A couple of weeks ago my parents were in town visiting and we were able to get the twin-size box spring and mattress for Little’s big-girl bed. We are awaiting the arrival of her bed frame from Matt’s parents house but since that probably won’t happen until after Boo is here, we needed to go ahead and begin transitioning Little out of the crib. Saturday afternoon we brought the “bed” home and Matt and my dad moved the crib out of Little’s room and the mattresses in. I was a bit concerned when she held onto the crib slat and said, “my nite-nite,” the whole time they were moving the crib. I guess she was just helping, though, because as soon as they started bringing in the box spring and mattress she got very excited. They set up her bed, we put on the bed-rail and sheets, and Little immediately climbed on and started laughing and playing. She seemed most amazed that she had a bed with a pillow and a “big dee” (her comforter). She has slept in her bed all night, every night since we set it up. She goes in at night (and naptime), gets in bed, and stays there until someone comes to get her the next morning; just like she did in the crib. She is amazingly compliant when it comes to bedtime/naptime, and we have not had any problems with her getting out of bed before she goes to sleep or getting up in the night even though she knows how to climb in and out by herself. And best of all, in the week and a half since she left the crib we haven’t heard a single “Da-da…uh oh” to let us know she fell out of bed. She is such a good girl and has made this transition so easily. I only hope that bringing home baby, potty training, and the other transitions we face in the next several months go half so smoothly! I’m having a bit of trouble with WordPress and comment e-mails. If you are a first time commenter it may take a while before your comment is posted due to the fact that I’m not receiving e-mail telling me there is a comment in moderation. Also, if you leave a question in the comments I may or may not realize it is there and reply. I am trying to look at WordPress regularly to check comments, so I will get to it eventually (probably). Please bear with me as my web-guru and I attempt to solve the problem. Spring cleaning/nesting has officially begun. Today I’ve cleaned the laundry room from top to bottom (de-cobwebbed, decluttered, wiped down walls & appliances) and cleaned the exterior of all the lower kitchen cabinets and the fronts of the appliances. This is one of those things I’ve been putting off for quite some time, so it feels good to have made a start. We’ll see whether my energy holds up the next few weeks to get the entire house done. Crib bedding was purchased and a paint colors were decided upon. The big painting project should begin this weekend. Little has her new mattress and box springs and is sleeping in her “big girl” bed (more on that in another post). The crib has been moved to Boo’s room, but the other furniture is still in Little’s so that she isn’t in an empty room with a mattress on the floor. And so that there is less furniture to maneuver around in the nursery while painting. So, we’re making progress. It seems slow, but it is coming along. We’re down to approximately 10 weeks, but as I always say…we seem to work best under pressure. You are currently browsing the Sidetrack'd weblog archives for February 2008.